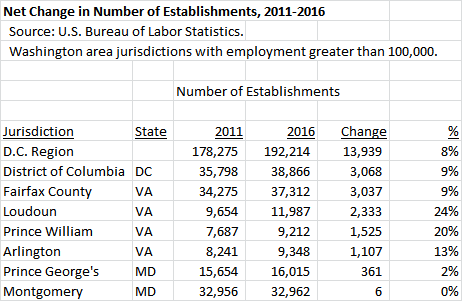 According to the U.S. Bureau of Labor Statistics, Montgomery County ranked 23rd of 24 local jurisdictions in the D.C. region in growth in the number of establishments between 2001 and 2016. Establishments are defined as physical locations of economic activity carried out by businesses, non-profits and governments. A doctor’s office, a restaurant, a factory and a grocery store are all examples of establishments. In the 2011-2016 period, MoCo stands out as particularly bad on this measure. 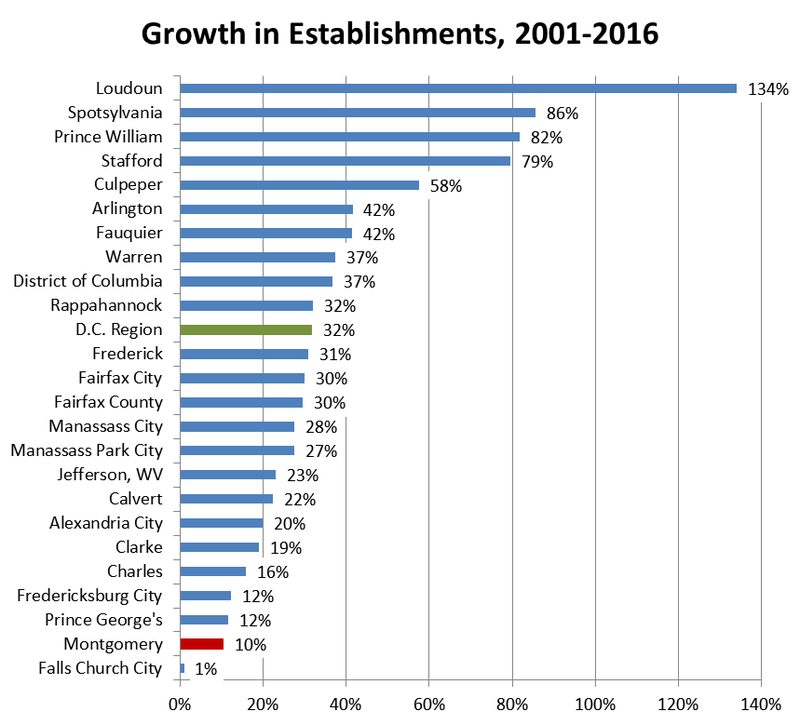 The chart below shows establishment growth for all local jurisdictions with more than 100,000 employees as well as the regional total between 2011 and 2016. The region’s 24 local jurisdictions collectively recorded a net gain of 13,939 establishments. D.C. and Fairfax County added more than 3,000 each. MoCo had a net gain of 6. Not 600 or 60. SIX. Business owners in the D.C. region have a choice. They can open locations in D.C., Virginia, MoCo or other places in Maryland. And they are voting with their feet by opening all over the region while avoiding Montgomery County. If we don’t bring them back, it will be hard for our county government to pay its bills without raising taxes.